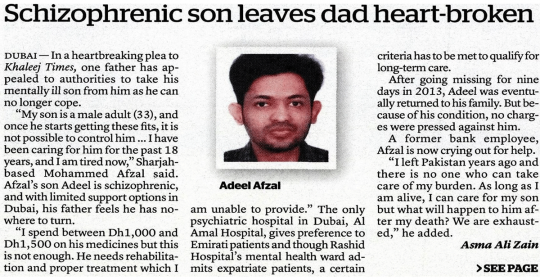 Khaleej Times | DUBAI | Asma Ali Zain | 16.10.2016 | In a heartbreaking plea to Khaleej Times, one father has appealed to authorities to take his mentally ill son from him as he can no longer cope. 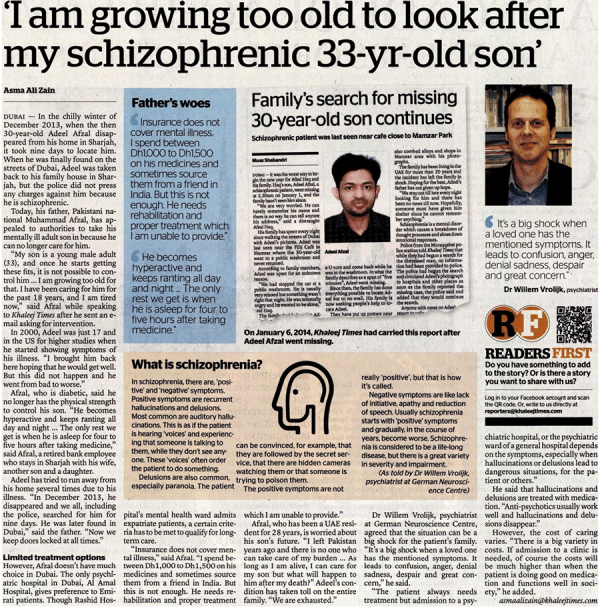 In the chilly winter of December 2013, when the then 30-year-old Adeel Afzal disappeared from his home in Sharjah, it took nine days to locate him. When he was finally found on the streets of Dubai, Adeel was taken back to his family house in Sharjah, but the police did not press any charges against him because he is schizophrenic. Today, his father, Pakistani national Muhammad Afzal, has appealed to authorities to take his mentally ill adult son in because he can no longer care for him. “My son is a young male adult (33), and once he starts getting these fits, it is not possible to control him … I am growing too old for that. I have been caring for him for the past 18 years, and I am tired now,” said Afzal while speaking to Khaleej Times after he sent an e-mail asking for intervention. Dr Willem Vrolijk, psychiatrist at German Neuroscience Centre, agreed that the situation can be a big shock for the patient’s family.